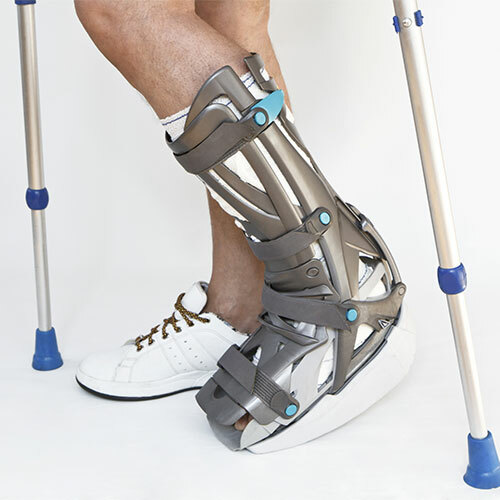 An orthotic is a brace or an external device made for a specific joint on the body. It can increase or decrease motion, or support a diseased or injured body segment. The main goals of a spinal brace are to correct or prevent deformity, stabilize weak parts of the spine and control pain. There are many different types of braces available to patients; some of the most common ones are discussed here. Corset braces are used to help treat back pain related to a trauma, injury, or degenerative disc disease. They are also occasionally used to immobilize your spine after a surgery to allow it to heal properly. Corset braces are made up of a lightweight cloth material, with metal bars that can be added or taken away, depending on your needs. If you suffer from sacroiliac (SI) joint pain, your doctor may have you wear a sacroiliac belt to lessen your discomfort. The SI joints, located on both sides of the base of the spine, are usually covered in ligaments to keep them from moving. If the ligaments are damaged or start to deteriorate, the SI joints can move and cause pain. A sacroiliac belt wraps around your pelvis and will compress the area around your hips to stabilize the SI joints. If you are suffering from lower back pain as a result of a lumbar spine condition, a lumbosacral belt may help manage and alleviate your pain. This type of brace is used to put pressure on your abdominal area, which reduces the amount of stress experienced in the lower back. It stabilizes the lumbar (lower) spine, to allow for healing to occur. These are typically used to help your spine recover after a spinal surgery or compression fracture. It allows the fracture to heal, while helping decrease pain that sometimes occurs where the thoracic spine (mid back) meets the lumbar spine (lower back). The hyperextension brace will limit movements like bending forward to allow for maximum healing benefits. At this time, the only non-surgical treatment for scoliosis is for the patient to wear a brace. Braces have been very successful in keeping the curve in the spine from progressing. Your doctor will choose the best brace to help, but the kind will depend on where the curvature is located. In treating scoliosis, braces are most helpful when treating a patient that is not fully grown, with a curve of 25 to 40 degrees. Whether you need a specialty brace after an injury or custom orthotics to help relieve foot pain, the orthopedic experts at The Florida Spine Institute are ready to support your goals for a healthy, active life.